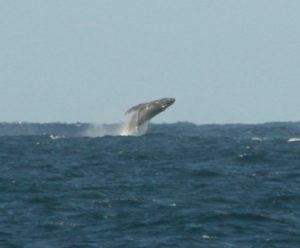 The winds were still blowing on Tuesday morning during our Wake up with the Whales Cruise, so maybe that accounted for how excited the whales in our area seemed to be. We saw a LOT of breaches — at least 12 from a pod about a mile and a half away from us, and many, many more from other whales in other directions. Later in the cruise, we were surprised when a Humpback surfaced about 55 yards from us at our 11:00, spouted a few times, and barely lifted his flukes as he took a dive. It was also windy for our Mid-Morning Whale Watch, which makes traveling a bit more difficult for us, but we did see 6 different Humpbacks. We got to watch them all surface, spout, and sound multiple times. Most of them were by themselves with the exception of one pod of three. Ocean Sports Whale Fact of the Day: If you were a researcher wondering whether ancient whales migrated along the same routes (or any routes for that matter) as our modern whales do, how would you go about answering the question? A PhD candidate at the University of California, Berkeley has a novel solution. He’s studying the fossilized shells of barnacles that had lived on these ancient whales. He found that you can actually look at the composition of the oxygen isotopes in the different layers of a barnacle’s shell and extrapolate where the whale was swimming and the temperature of the water the whale was swimming through when each particular layer of shell was laid down. Based on his findings, we know that whales have been living the migratory lifestyle for millions of years! Fascinating. You can read more about this research here. ← How do Humpbacks Find Hawaii?